A Thai wedding photographer, Ekkachai Saelow, always like to capture the finer details of his subject in his photos. But when he was asked to take a photograph of a couple for their engagement shoot, he took that phrase “finer details” to the next level. 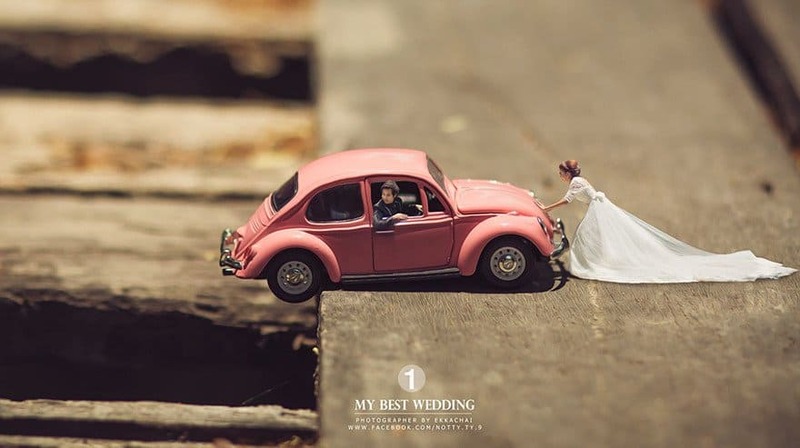 He literally turned the couple into small persons by using a technique designed to introduce his subjects into the miniature macro world. The resulting photos were surreal and stunning in its simplicity! In the first photo, the couple was seen sitting on a ledge next to a vintage car. 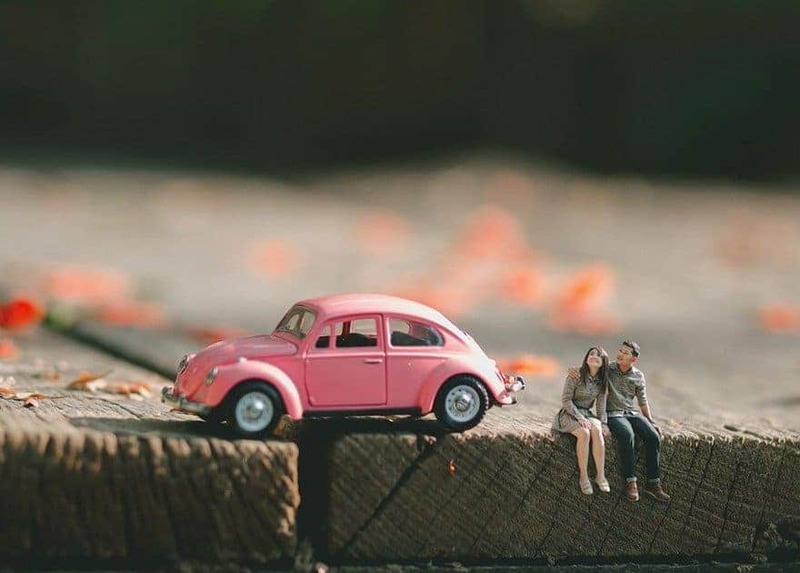 Both the couple and the car were turned into micro images and they look dwarfed by the fallen leaves behind them. In the next photo, the miniature couple is walking on a pot of plants while carrying an oversized leaf above their heads for cover. Two words: too cute! The third set of photo is adorable as the first two. Once again, a vintage car is involved wherein the couple dressed up in a fun vintage shoot. This one is just too adorable. 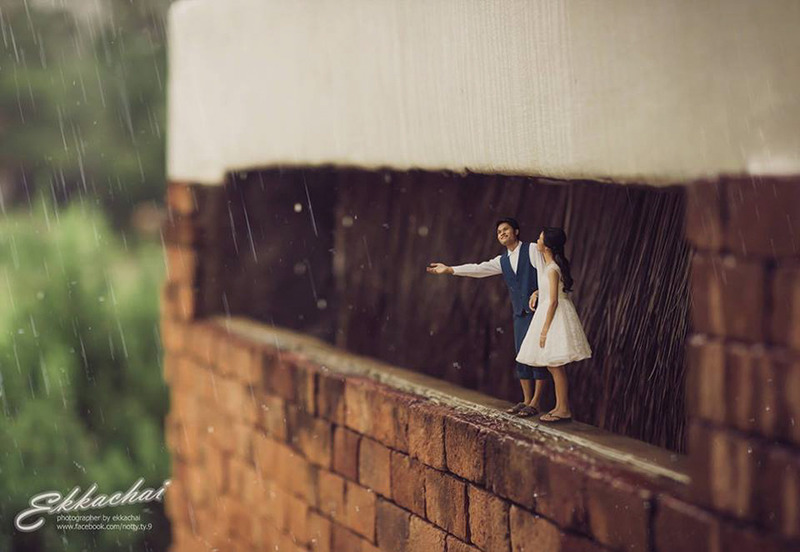 The couple are standing on the edge of a wall while playing with the rain and holding hands! This one involved a bit more editing tricks but fun nonetheless. The lady rides a bike while her partner tries to cling on the bike. Like them, both the bike and the car used as props were also turned into miniature versions. This is a simple shot with the couple sitting next to each other. To keep up with this theme of turning them into miniature folks, photographer Saelow shrinks them and places them atop a tree branch. The famous Thai photographer isn’t famous for his works for nothing. He likes to utilize nature and puts his subjects against them to provide perspective. It is a fun and unique concept that easily made him stand out in the industry.